Being prepared for your PA program interview is crucial for success on interview day. Knowing how to handle any question that’s thrown at you is a good way to keep your cool during the interview, but sometimes it helps to know the questions that might be asked of you ahead of time. Preparing your PA school application can be difficult without any outside help. Creating a timeline for the application process can help you stay on top of your application materials, but it won’t provide you with tools you can use to actually help you prepare. When considering a career in healthcare, there are plenty of options to choose from. Most people assume that becoming a doctor is the best option for working in medicine purely based on their high rate of pay, but this simply isn’t true. If that logic were applied to other fields of work, we’d have a surplus of architects and no carpenters, or an abundance of chefs and no farmers. When you’re in the interview room, the last thing you want to do is lose your focus. It’s easy to lose your focus if you’re unprepared, but you can be thrown off if you’re asked a question that’s out of bounds or inappropriate, even if you’ve spent the past year preparing for your interviews. Questions should be about your qualifications to become a physician assistant, not about your personal information. If you find yourself facing an uncomfortable or seemingly inappropriate line of questioning, know your rights as an applicant. You do not have to answer out-of-place, unrelated, or illegal questions directly and can choose to either defer your answer or address the questions as inappropriate. 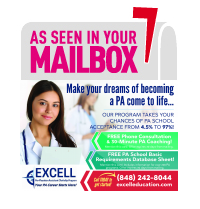 Do you know what the top PA programs are looking for? When you’re preparing for your physician assistant school application and interview, you’ll want to familiarize yourself with the history of the PA profession. Going into your interview without a firm understanding of the history of the PA profession will make you seem unprepared and generally uninterested in the PA career path. Take a moment to familiarize yourself with our brief overview of the PA profession. Dr. Eugene A. Stead is known as the father of the PA Profession. Stead is well known for wanting all PAs to have relationships with physicians to increase their body of medical knowledge. He also found the concept of distance education to be very efficient, believing that it was more valuable to know how to quickly look up information as it was needed that to try to remember everything. As of now, there are around 92,000 PAs eligible to practice. By 2020, the demand is expected to grow to 150,000, making it the 3rdfastest growing profession in the country. In fact, the PA profession has been rated as one of the top 30 careers for job satisfaction, prestige, job market outlook, and salary, and has been included in the top 10 best jobs in America on Glassdoor and Forbes for the past few years. Still, there is a notoriously low acceptance rate for PA programs due to the small amount of available spots and large amount of applicants. The best way to ensure your acceptance is to apply to multiple programs, have a stellar personal narrative and application, and perform well at your interview. If you ever need a quick refresher, check out this video from the AAPA and the Physician Assistant History Society that traces the origins of PAs. Become a part of history – start taking your steps towards becoming a successful Physician Assistant today!